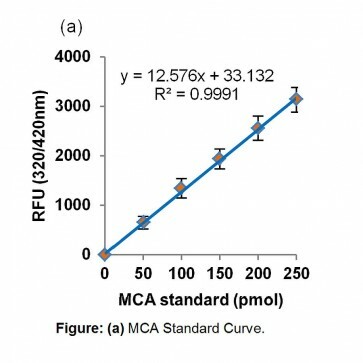 Endothelin Converting Enzyme 1 Activity Assay Kit (Fluorometric) | K536 | BioVision, Inc.
Endothelin Converting Enzyme 1 (ECE1; EC: 3.4.24.71) is a membrane-bound metalloprotease that cleaves inactive big endothelin (big ET-1), which is the precursor of active endothelin. Studies have shown that big ET-1 could be used as a predictor of survival in patients suffering esophageal squamous cell carcinoma. 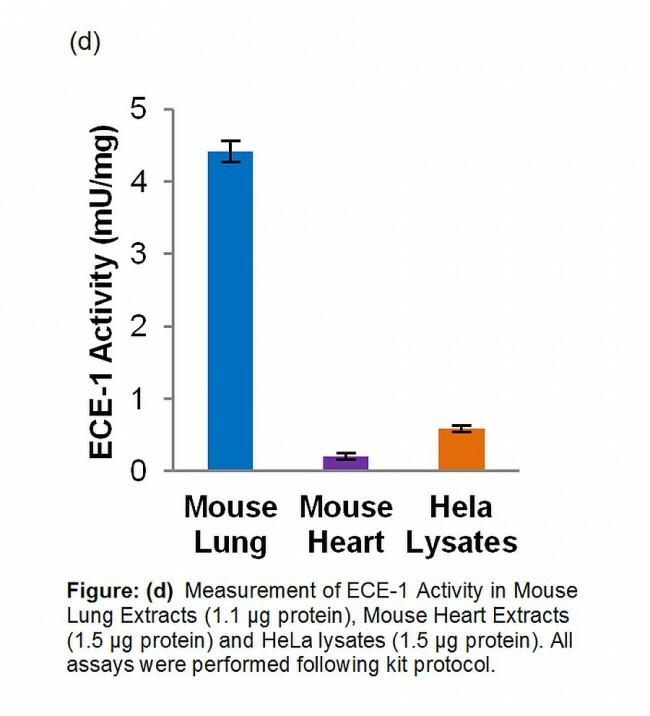 ECE-1 is abundantly expressed in vivo in endothelial cells producing mature ET-1. As of today, Endothelin is the most potent vasoconstrictor known and it has cytokine- or hormone-like activities. 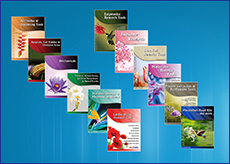 Therefore, ECE-1 could play a significant role in pathogenesis of cardiovascular diseases and Alzheimer’s Disease. BioVision’s Endothelin Converting Enzyme 1 Activity Assay Kit utilizes the ability of active ECE-1 to cleave a synthetic substrate (MCA-based peptide) releasing free fluorophore, in the presence or absence of the ECE-1 Inhibitor Mix. The released f.luorophore can be easily quantified using a fluorescence microplate reader. 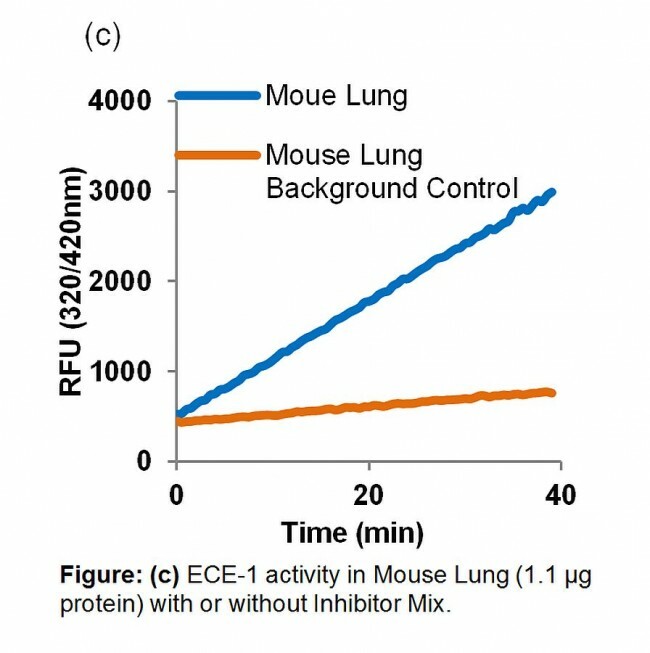 Our kit uses a unique combination of substrate and inhibitor that specifically detects ECE-1 in a variety of biological samples. Contribution of other enzymes with similar catalytic properties - i.e. Endothelin Converting Enzyme 2 (ECE-2), Angiotensin-Converting Enzyme (ACE1, ACE2), and Neprilysin is compensated for within the assay. 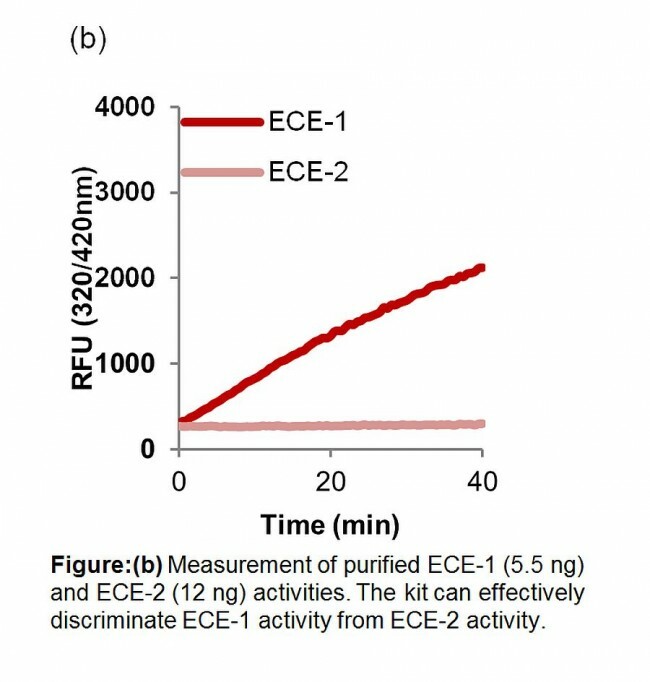 Our assay kit is simple, specific and can detect as low as 0.5 µU of ECE-1 activity.